If you cook fish frequently, a quick broiling, grilling, sauté or poaching may be your technique of choice. But before you put a piece of plain fish on a plate with vegetables on the side, consider serving it en brodo: in broth with vegetables. In Italy, not just fish (pesce) but tortellini and other pasta types are served en brodo. The vegetables get cooked in the broth, which adds more flavor. 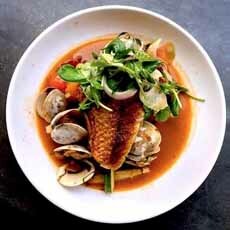 And if you poach the fish, that takes on more flavor, too. The purpose of the broth is not to serve as a bowl of soup, per se, but to provide a flavorful base for the dish (and yes, the “soup” at the bottom is eaten, so include a soup spoon as well as a fork). In the recipe below, we use vegetable or fish broth as the base. Both the vegetables and fish are cooked in the broth (i.e., poached fish). The broth recipe below has a Thai accent. We’re passionate about Thai flavors, but if you don’t like them, just leave out the asterisked* ingredients. Replace them with your choice of bok choy, celery, mushrooms, parsnips, zucchini and herbs of choice. Flavor the broth with salt and pepper instead of soy sauce and lime juice. And include something green for a color accent (photos 1-4). You may not want to cook them in the broth, but steam them separately in the microwave. Add to the dish when plating. 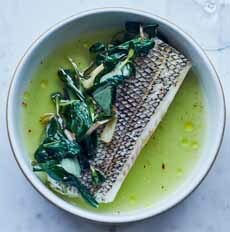 Sautéed black bass in vegetable-herb broth with droplets of basil olive oil (photo courtesy Empire Diner | NYC). 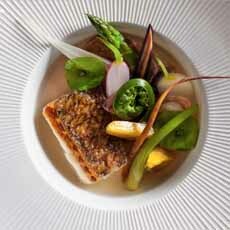 Grilled cod in mushroom broth (photo courtesy Mihoko’s 21 Grams | NYC). 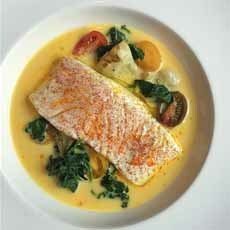 Poached halibut in coconut broth (photo courtesy David Burke | Fishtail). 1. PLACE the stock, cilantro, chile, garlic and ginger in a large saucepan and bring to a boil. Reduce the heat and simmer gently for 20 minutes. 3. SEASON to taste with a dash of soy sauce and lime juice. Divide the sprouts between 2 large bowls and pour over the soup. Garnish with coriander leaves and accompany with lime wedges. WHAT’S THE DIFFERENCE BETWEEN A FILLET AND A FILET? Just the language, which impacts spelling and pronunciation. Fillet (FILL-it) is English and filet (fee-LAY) is French.